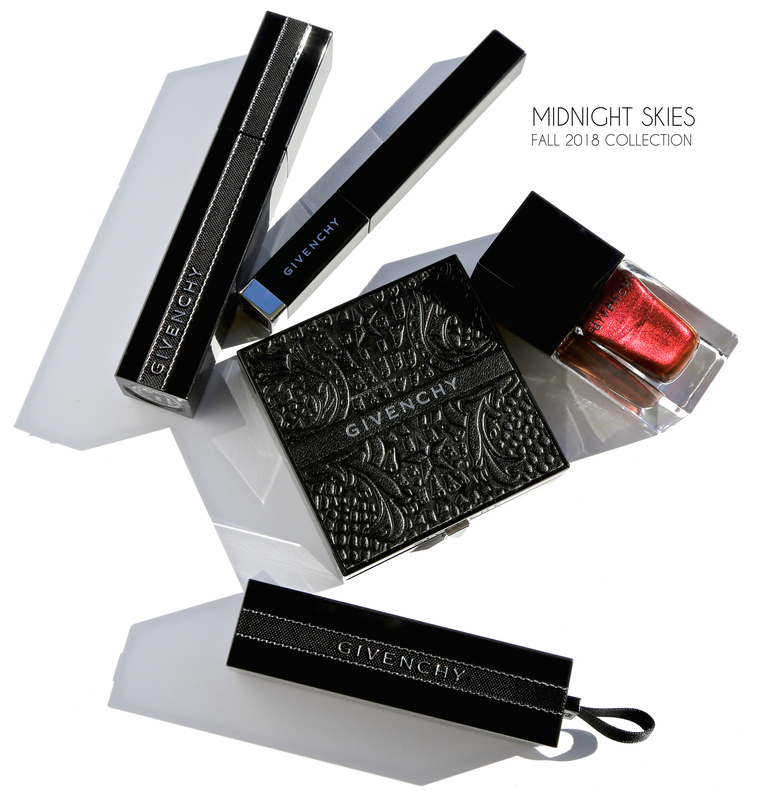 Inspired by the iconic black dress designed by Hubert de Givenchy that Audrey Hepburn wore for the film Breakfast at Tiffany’s, the brand’s head of makeup, Nicolas Degennes, created Midnight Skies — a collection that draws on the mystery of a vast star-lit sky coupled with lush jewel-like tones. Or at least, that’s how I see it. 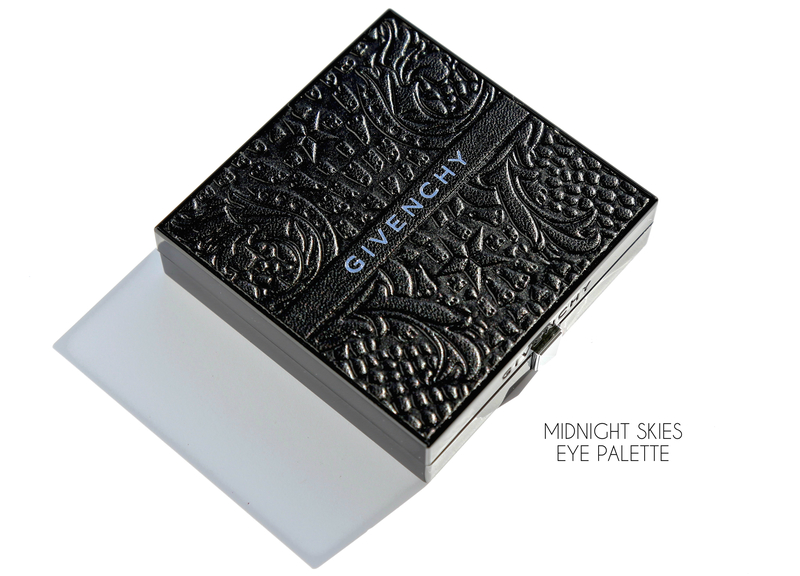 Midnight Skies Eye Palette, limited edition (CAN $72.00) | Housed in genuine leather embossed with a raised design (seriously: how absolutely GORGEOUS is this cover? 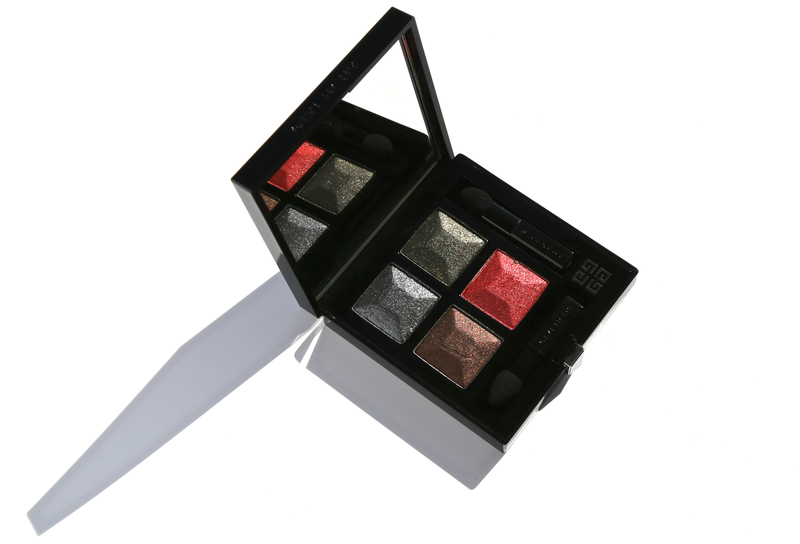 ), the four shimmery shades of this palette have mother-of-pearl particles in the formula to help provide a multidimensional shimmer, while the buttery smooth texture ensures an effortless application. Of course, as we’re dealing with shimmer here, it’s always best to go in with a patting motion of your brush first in order to keep any fall-down to a minimum, before doing any blending. Three of the shades are black-based and have a complimentary hue: gunmetal, olive, and coppery brown, while the red shade truly stands alone due to it’s inclusion of ‘evolving’ pigments which help the colour shift from orange→pink→red. For the swatch below, I opted to show all four intensely applied, but you can also wear each as a diffused wash of colour, layered, or even with a dampened brush for maximum impact (just stick to one corner of your selected shade to avoid compromising it). The gleam you get is absolutely beautiful with all colours staying true until removed — when worn over primer, that is. 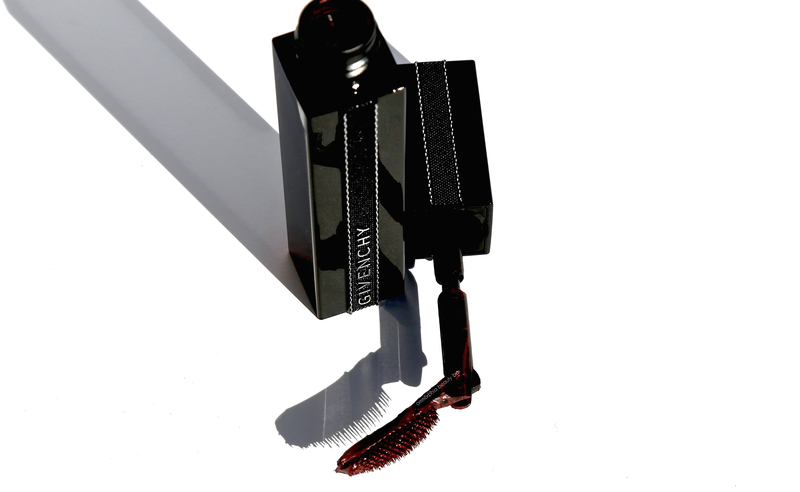 Noir Interdit 2 Dark Red, limited edition (CAN $38.00) | This revolutionary mascara has a unique wand that can bend up to 90 degrees, enabling the brush to get as close to all lashes as possible — without risking smears along the skin (we’ve all done the mascara-along-the-nose thing, am I right?). The formula contains Black Rose Oil and fortifying vitamins which add nourishing properties and help keep lashes from feeling stiff and/or crunchy, with the deep burgundy hue of this version stemming from the inclusion of red mother-of-pearl. The brush is also quite effective at not only ‘grabbing’ each lash to deposit product, but provides fullness and length as well. Staying power is equally impressive, without showing smears, smudges or flaking, and all easily comes off by using a dual-phased remover. Oh, and as an added perk, it also smells absolutely divine. 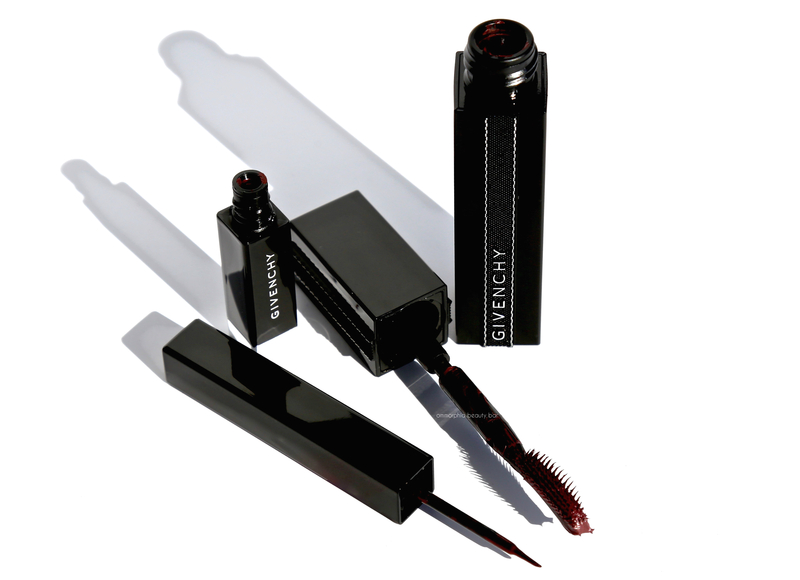 Liner Vinyl 7 Red Night, limited edition (CAN $39.00) | This liquid liner has an extremely fine brush with enough rigidity to the bristles for precision work, yet still flexible enough that it glides easily along the skin. The texture is creamy and provides full coverage with each swipe and also buildable if need be, without fear of it moving anything layered underneath. 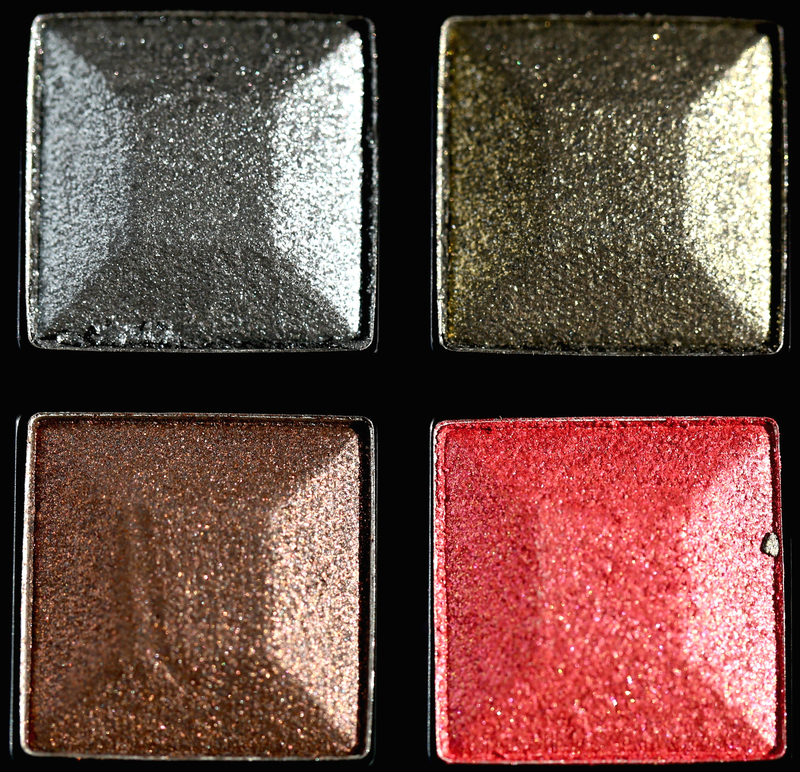 Infused with red mother-of-pearl for a sophisticated metallic effect to the finish, staying power is excellent without showing any signs of cracking or flaking during wear time. By the way, both the mascara and liner look absolutely spectacular for those with green eyes (like moi!). 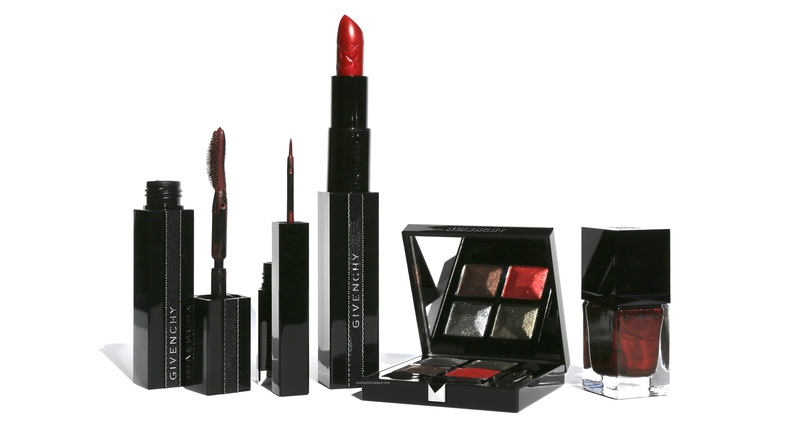 Rouge Interdit 26 Midnight Red, limited edition (CAN $41.00) | Givenchy’s Rouge Interdit lipsticks can best be described as a treat for the lips — I’m serious. With a formula containing Black Rose Extract and other nourishing oils to help provide a comfortable wear, the bullet of this version comes double embossed, bearing the brand’s logo on one side and a bevy of stars on the other. 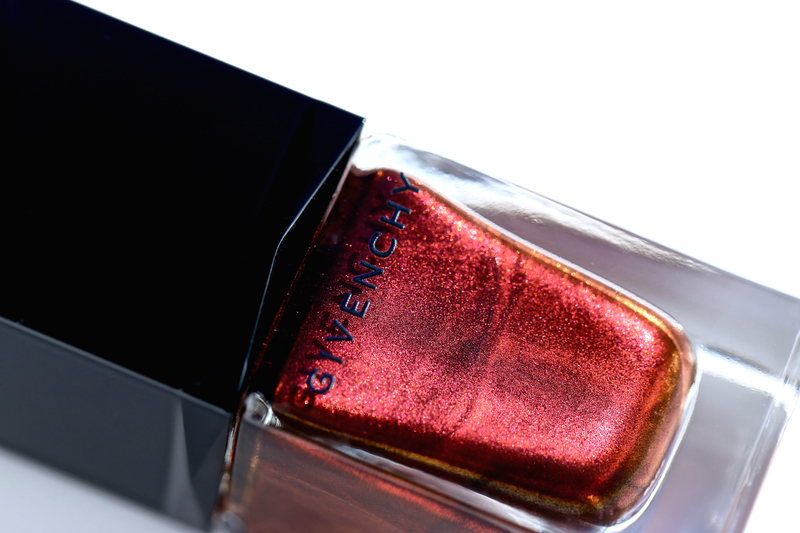 The shade is a stunning red with an orange undertone to lend it warmth (although those with cooler complexions can easily wear this as well — fear not), with a slight shimmer in the mix to lend it a soft metallic gleam. 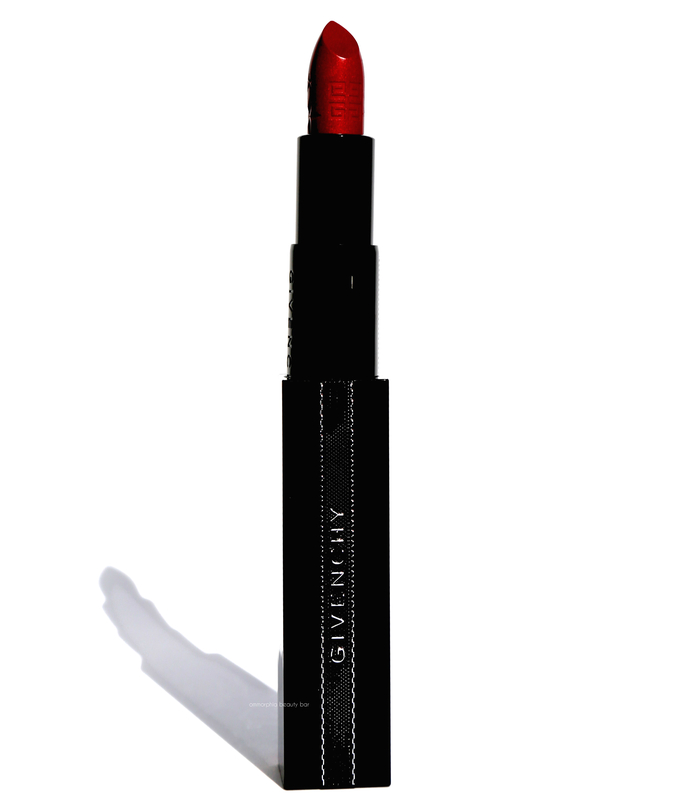 The texture is unbelievably buttery smooth, gliding effortlessly along the lips providing full coverage from the very first swipe, and will not migrate into any surrounding lip lines. As this has an emollient nature, reapplication will be needed at some point (i.e. : after eating/drinking), but that just gives you a reason to whip this beauty out in public. Note that a light stain will be left behind, once the majority of colour has faded — add a swipe of lip balm and BAM! You’ve just created another look. 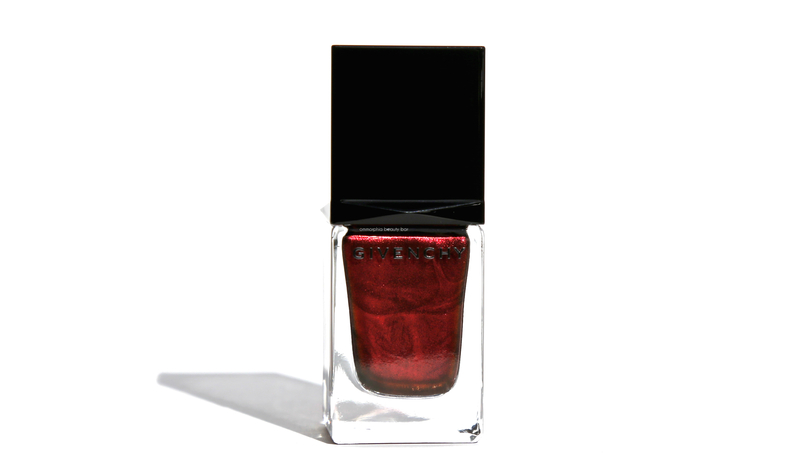 Le Vernis 11 Cosmic Night, limited edition (CAN $29.00) | A deep jewel-like burgundy hue with pearl black shimmer for added depth. The formula is STELLAR and can certainly pass as a 1-coater, although I prefer 2 layers for the best coverage. 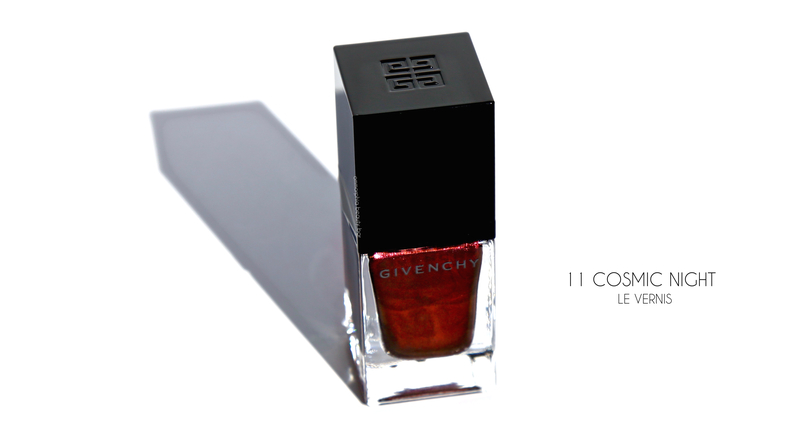 Self-levelling and coming to a naturally über-glossy finish, the final effect upon the nails is like banked embers, giving a lit-from-within type of glow. 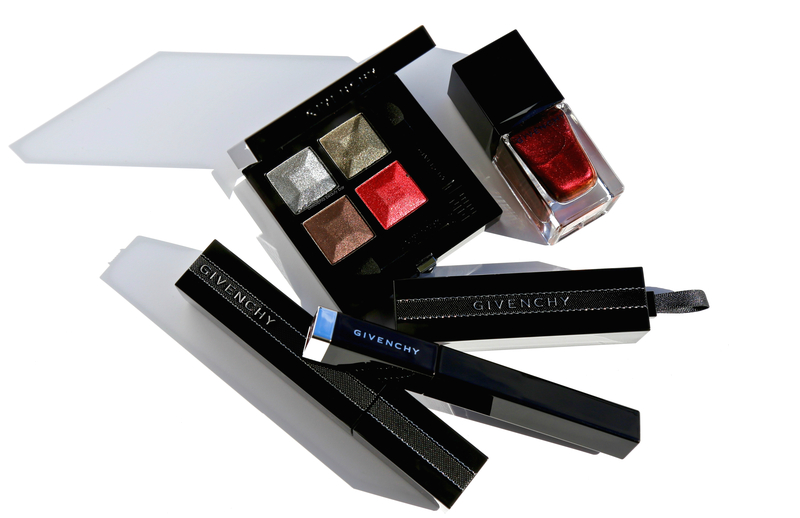 It should be stated that Givenchy lacquers not only have one of the best formulas out there, but one of the best brushes as well, with bristles that are gently rounded to easily follow the natural shape of your nails, with a perfect mix of flexibility and rigidity to make application goof-proof. Major bonus points also scored for the fact that this shade is non-staining upon removal. The swatches below are with 2 coats of polish, no top coat. 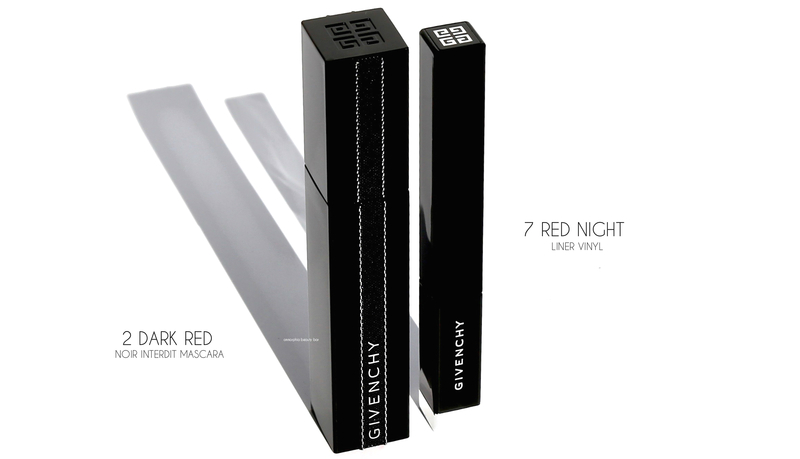 Do you recall the Givenchy Eye Fly mascara of the early 2010s (maybe earlier, I can’t remember). It was amazing, waterproof, and came in several colors. If you ever tried that do you feel this mascara has any similarity? If not this, any other product you’d recommend? I’m so oily that I must use waterproof + Double Fix, but EF was so Holy Grail it did everything for me. Lift, lengthen, no smudge, color! Sadly I never tried that mascara as I had other faves at the time. 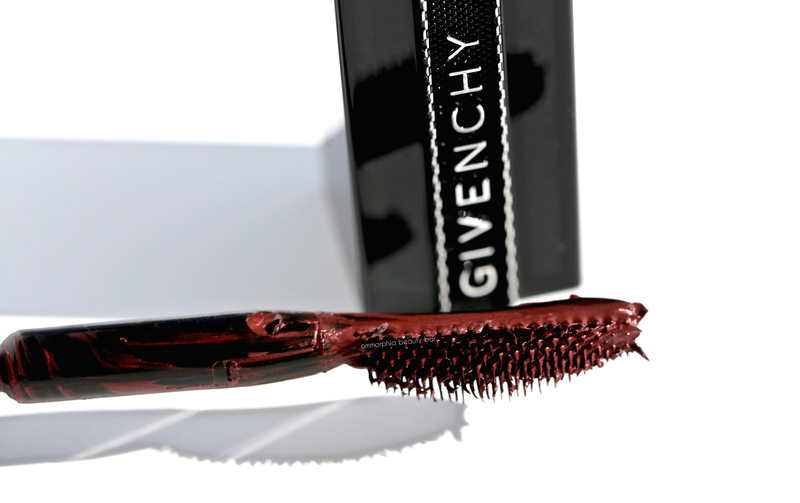 One mascara from Givenchy that I adored and went through multiple tubes of (as well as scooped up any limited edition colours that it came in), was the Phenomena Eyes — I was obsessed with the ball-shaped brush and how perfectly it grabbed even the tiniest of lashes! Regarding any recommendations, one option you can try is to apply a double layer of primer to your lid; I have oily lids as well and the primer I found works the best is NARS’ Smudge Proof Base (although the latest one from CHANEL is not bad either, but after testing I still prefer the NARS). If you can keep the oiliness in check from your lids, there should be less transfer to lashes and therefore hopefully the mascara will play better as well. It goes without saying that you should probably stick to waterproof versions, but another trick to apply the waterproof mascara first, then you can add a coat of regular mascara on top. Hope this helps in some way! 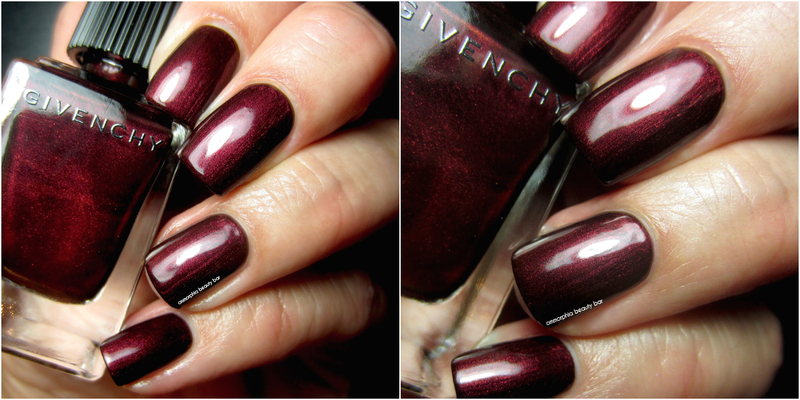 Stunning collection, with the nail polish really commanding my attention..
It’s a gorgeous shade and while I haven’t done a physical comparison yet (but I may to that today), it also seems to me to be a very close dupe for CHANEL’s legendary Malice! 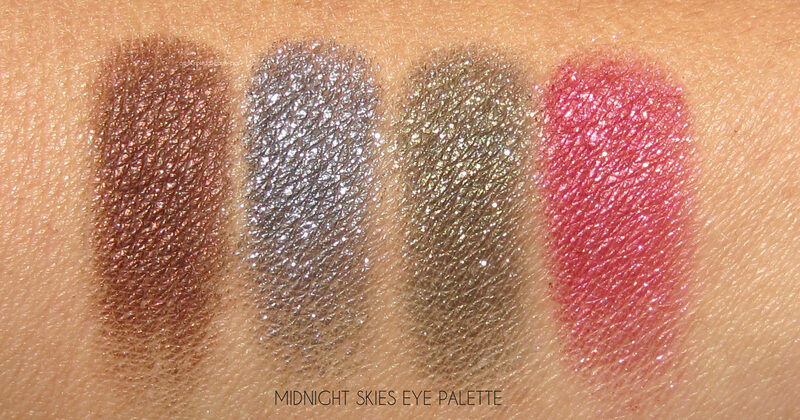 Argh….you are tempting me with Midnight Red lipstick and Cosmic Night nail polish. How many lips do I have? I can paint each nail with a different colour though…? LOL! Happy to hear you liked both! PS: lipstick is easier to change than nail polish! Just saying’!! ?